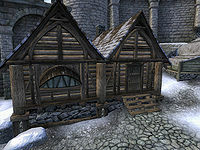 Arnora's House is a house in southern Bruma located between Jearl's and Regner's houses. 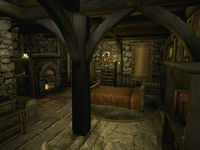 It is the residence of Arnora Auria and consists of only one zone, Arnora's House. At the front door in the northwest corner sits a chest of drawers that contains clutter and holds two tomatoes, two pieces of mutton, an onion, and a potato in a basket atop it, while the basket on the floor holds two more tomatoes and a pear. The narrow path to the northeast corner leads to three clutter sacks, a clutter barrel, and a sack of flour. A food cupboard sits in the southwest corner and the table in the middle holds a loaf of bread, some rice, and some garlic. Behind the column is a clutter chest and a food barrel sits at the head of the stairs to the basement floor. At the foot of the stairs is a bookshelf that holds seven strawberries and a wine rack next to it that holds three bottles of Surilie Brothers wine, two bottles of cheap wine, and a bottle of Tamika's West Weald wine. Beside the stairs sits a chest of drawers that holds clothing and another set on top of it that holds clutter as well as a clutter barrel. 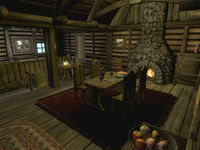 Beside the fireplace, a bookshelf holds a novice detect life scroll, burgundy linens, thick cowhide shoes, a cure poison potion, and a steel dagger. A clutter chest sits beside it. On the west wall, a set of shelves that contains clutter also holds tan linens and a russet felt outfit, with a pair of russet felt shoes on the floor. In the northwest corner, Arnora's chest holds her amulet. Arnora's chest and the three clutter sacks are the only containers in the house that do not respawn. Arnora carries the key to this location. This page was last modified on 8 July 2018, at 10:12.